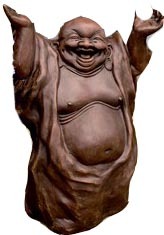 Everyone must have seen the statue of “Laughing Buddha”. He is also called as the “Happy Man”. I have a few of these idols and some of these have been with me for a very long time. It never occurred to me to figure out the significance of the idol. I always thought it was Gautam Buddha and wondered why it was so different from the other serine images and idols of Gautam Buddha. Just the other day a friend posted a reference and I was compelled to do some reading and found out. It was a pleasant shock to realize that Laughing Buddha is not a Gautam Buddha at all, but an eccentric Chinese Ch’an (Zen) monk who lived in china, Circa 907 AD during the Liang dynasty. He was a native of Fenghua, and his Buddhist name was Qieci literally meaning “Promise this“. 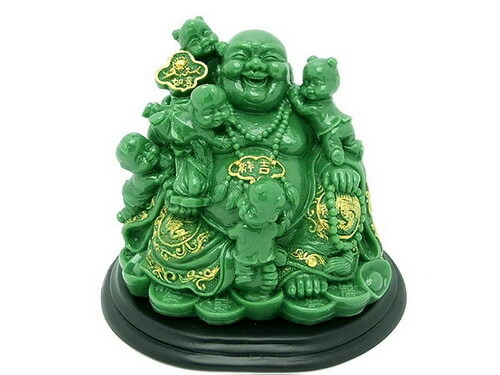 He is also referred to as Hotei or Pu-Tai and is best known as the “jolly Laughing Buddha”. In China, he is also known as the Loving or Friendly One. Hotei is a significant part of Buddhist and Shinto culture and is regarded as an incarnation of the bodhisattva who will be Maitreya (the Future Buddha). 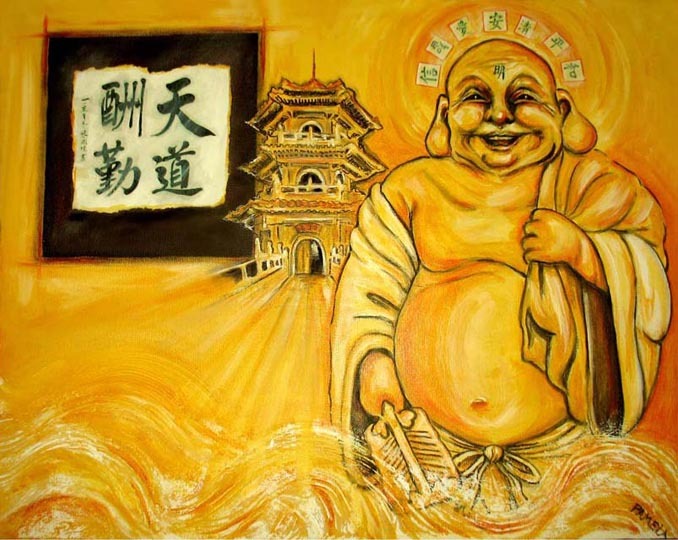 His large protruding stomach and jolly smile have given him the common designation “Laughing Buddha” and he is regarded as a true Zen master. 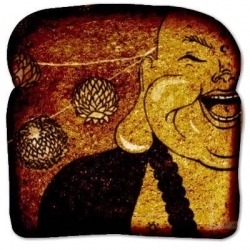 Like all legends of yester years Hotei has a great inspirational story. While I am not sure if this has any historical authenticity but it still is a very good read. The legend says: The jolly saint would travel from place to place in search of wisdom and spread the zen philosophy. Where ever he went he attracted curious eyes; he was a funny looking man with a big belly and an even bigger smile on his face. He would go to a town square and wait for people to gather, which was never a difficult thing for him. Hotei would then distribute sweets and small toys to all children who had gathered around him. When the euphoria of gifts and presents died down, he would slowly keep his bag down, look to the sky and just start laughing. He would continue to laugh and not care if others joined him. Soon, his laughter would turn contagious and all who had gathered would begin to laugh. In some time the whole town would begin to laugh thanks to the mysterious monk. After sometime he would pick the bag, which he had kept down, smile to all, and go to the next town. It is said that he did the same thing in every town he visited. It was the only thing he did. 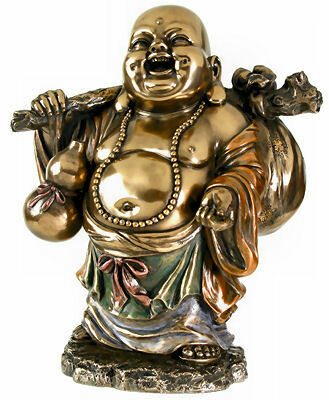 It was his way of bringing enlightenment to people, hence his name the laughing Buddha. It symbolizes that more you give, more you get. He referred to it as the “Joy of Gifting”. The children represent the qualities that one is born with and the qualities that we should all cherish; living in present, cheerful, without ego, without prejudice and un-judgmental. I term it “return to innocence”; a blissful state of life where every day is a day of learning and something to look forward to. The bag represented the burden of human existence. The problems that we love to accumulate. We live in a self-created illusion of difficult life. He illustrates it by pointing out, we are great at giving advice and solutions to deal with a difficult situation as long as the problem does not belong to us. But the same creativity is lost if it happens to be our own problem; we simply don’t seem to find any solution. The monk’s symbolic act of dropping the bag is part of a more significant Zen philosophy. It represents separation from burden, disassociation from your problem and looking at it from the eyes of an outsider and then attempting to solve the problem and getting on with life. It also represents the overall Zen and East Asian Philosophy of detachment of your soul from the limitations of your human senses and look at the reality with the objective eyes of your soul. Finally the contagious laughter signifies that “being happy” philosophy is as contagious as laughter. It can also be interpreted as one cannot bring happiness in people around them just by being unhappy with his or her own life. I am not sure if story is a true fact, or even less sure if Hotei ever said any of the above but like all legends it is a good story. It propagates living a happy life and emphasizes that being happy can make this world a better place. That message in itself is worth to think about. So stay happy folks! !